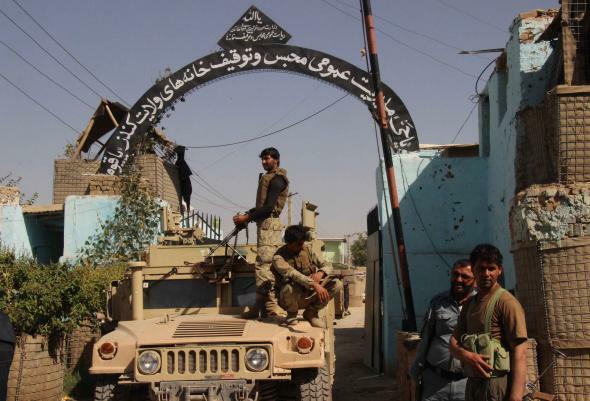 Taliban withdraws from Kunduz shortly after major Afghanistan victory. Afghan security forces stand guard at the main gate of a prison on Oct. 8, 2015. The Taliban announced on Tuesday it had withdrawn from Kunduz just 15 days after its surprising takeover of the northern Afghan city. The Taliban offensive in Kunduz, its biggest military victory since 2001, exposed worrying deficiencies in the Afghan military’s ability to contain the increasingly sophisticated insurgent attacks and spurred U.S. forces to rally and support local troops.